This is SKYRACK 31, dated 6th April 1961 and published by Ron Bennett, 7 Southway, Arthurs Avenue, Harrogate, Yorkshire, England. 6d per copy, 2/6d. for 6 issues. 35cents for 6 issues in USA (65cents for 6 issues sent airmail) where subscriptions should be sent to Bob Pavlat, 6001- 43rd. Avenue, Hyattsville, Md. THE 1961 NATIONAL CONVENTION was held at the New County Hotel, Southgate Street, Gloucester from Good Friday, 31st March to Easter Monday, 3rd. April. Probably the two most notable facts to emerge from the gathering were that judging from the large number of new faces present the BSFA recruiting system is extremely successful and that science-fiction conventions are back in fashion The two points are of course probably related, but it is true to say that the bias of the convention was towards the sercon rather than towards the fannish. This is not to say that the fannish element was left uncared for - far from it - but this was a programmed convention. Neofans were not left out in the cold but mixed well with the old guard and indeed, a good time was had by all. The trouble with conventions like the LXIcon, as this get-together was termed, is that they are all too short. IT LOOKS LIKE HARROGATE IN 1962. At the Sunday BSFA A.G.M. it was decided that next year’s con should be held in the north of England. Ron Bennett was asked whether he would be willing to arrange for the con to be held in Harrogate; he announced that already had the names of a tentative con committee. The hotel in Harrogate still has to be approached (no, we have more than one hotel...that should read “the” hotel) and registration fees worked out. Everyone to whom I spoke about Harrogate as a consite was most enthusiastic. The Convention Committee lines up at the moment as Norman Shorrock, Phil Rogers, Sid Birchby, Terry Jeeves, Ken Slater (plus Davids Eggleton and Barber)and. Ron Bennett. This is the first issue of Skyrack to be put on to stencil in a moving car, driven by Valerie Jeeves en route from Gloucester to London. THE CON BEGAN ON FRIDAY this year and instead of Friday evening being left blank (programmewise) for fans to mix, the crowded table of events due for the weekend was spilled over into Friday. Four or five short fantasy films were shown, including a badly documented puppet film and an extremely obscure Flemish film, “The Magic Ring” of which the colour photography was plusperfect. Altogether, though, the audience agreed that this showing was a disappointment. THE PROGRAMME BOOKLET was once again produced by that master of programme booklets, Norman Shorrock, assisted by Bob Parkinson and Eddie Jones. This superb production included articles on sf by Ken Slater, an obituary to Doc Weir by Eric Jones and a sparkling introduction to Kingsley Amis by Brian Aldiss, as well as some wonderful Eddie Jones artwork. Eddie, incidentally, designed the professional-looking lapel badges which contend admirably with the type of badge favoured by the U.S. Worldcons. SATURDAY’S PROGRAMME began in the morning with a tape-play, “Typo”, produced by younger fen from Cheltenham and Nottingham University. Some of the humour was extremely juvenile and technique showed inexperience, but on the whole this play showed a good understanding of fannish ingroup jokes and it was well received by its audience. GEOFF DOHERTY, the editor of the 1960 Murray publication, “Aspects of Science Fiction” spoke on Saturday afternoon as “An Alien in the Academy,” presenting an outsider’s viewpoint of sf as reading matter, and its literary value, especially as regards its place in school. His main point was that while Wells and Verne are accepted by the general public as “respectable” writers modern writers are not. SF has a degraded literary value as an image in the public eye, he said. THE DON FORD SLIDE SHOW was an item that had been eagerly awaited and this was held on the Saturday afternoon. The projector lamp was a weak one so that the majority of the fine pictures lost some of their brightness, but one could not in any way begin to fault the slides themselves or the excellent taped commentary that Don had provided. The slides showed the 1960 Midwestcon, views round Cincinnatti (with a side note to Ella Parker), and the 1960 Pittcon with Eric Bentcliffe greatly in evidence. Thanks, Don. BRIAN ALDISS introduced the Convention’s Guest of Honour, Kingsley Amis,whose latest book “New Maps of Hell” was on sale at the convention, by telling of Amis’ “Portrait” mention in a New Worlds Aldiss feature and saying that Amis’ later success in the literary field was due entirely to him (Aldiss). AS A MAINSTREAM WRITER who is turning more and more to sf, Kingsley Amis attacked sf on two fronts, the elements of science and the elements of fiction. Too much sf is of the gimmick class, he said, a type of pseudo-science. Time travel, for example, is impossible, but is accepted as near reality by the reader. In so far as sf encourages daydreaming and is a superficial fantastic entertainment this is a bad thing. It is not a deplorable aspect of the genre if the reader himself realises the quality of what he is reading, but too often, Amis went on, the reader is happy in his rut of day dream reading. SF should train the reader to discriminate between the levels of depth of thought behind these stories and in so doing should give the reader the taste for better literature. The reader should ask himself whether the gimmick in a story is scientifically possible or impossible without blindly accepting it. This does not prevent the reader from enjoying the story but does teach him to think. Too much sf today suffers said Amis, from a scientific contamination which encourages the thought that everything is possible through science. Kingsley Amis then went on to startle his large audience even further by saying that as fiction, Sf is not imaginative enough. .There are too many old hat ideas, too many accepted themes and descriptions. “Aren’t you tired of humanoid aliens?” he asked. It was all too apparant how badly bad sf authors write he continued, but is it always realised how badly good sf authors write. He quoted from a story by Arthur C. Clarke which he dismissed, probably rightly ( judging from the selected extract), as belonging in the field of popular romance. He concluded his thought-provoking talk with an appeal for more balance, particularly in quality, in science fiction. KINGSLEY AMIS was immediately taken up on several points by his audience, an event for which he seemed well prepared and it was obvious that at least a portion of his talk had been presented with the idea in mind of raising comment from his audience. Asked about time travel and psi phenomena he said “There is no such. thing as a thought pattern, I’ve never seen one, show me one,” to which Peter West immediately answered by saying, ”I’ve never seen gravity, show me......” Amis however was even quicker to counter-attack thrusts from Ted Tubb who was obviously trying to whip up controversy and comment from the audience. As Ted made each of his points, Amis quickly cut the ground from under his feet on each point so that Ted was left floundering without a solid foundation of fact on which to build. As a result, though, other comment was forthcoming from the audience with interesting points being raised by Ted Carnell, Ken Bulmer and particularly Dave Kyle who brought up the point that originally sf readers had collected sf entirely because it was sf; whether it was good. or bad did not matter; one lived for sf and one tried to convert other people to reading sf. Now that sf is accepted by the general public that public should. be made aware that there is good sf and bad sf. DAVE AND RUTH KYLE were welcome visitors to the convention and are based in this country until the end of May. They will probably be taking a side trip over to Continent. Dave was last at a convention in this country only last year but we haven’t seen Ruth since the London WorldCon in 1957. Ruth searched diligently for matzoball soup and Dave showed, at a room party, the cine shots he took at last year’s London Convention, shots which had improved several thousand percent over the films he showed at last year’s con and which are now only l00% perfect. THE HOTEL MANAGEMENT were inclined to be kind as far as room parties were concerned as long as these took place on the hotel’s first floor. Main party centre each night, however, was the second floor two room suite occupied by ladies of the Science Fiction Club of London, Ethel Lindsay and Ella Parker. At one party Alan Rispin auctioned his hat for TAFF, the top bid being made by a group of thirteen (everyone present at the time) who immediately cut the hat into 13 pieces. APART FROM THE KINGSLEY AMIS TALK another highlight of the convention also took place on the Saturday. In the evening was staged the Transgalactic Tourist Party with some of the best displays of individual and group fancy dress ever seen at British conventions. It was well understandable that the judges had an extremely hard time deciding on a winner, but the first prize was awarded to Liverpool’s Eddie Jones as an Ambassador from Triton. Ina Shorrock, BSFA Chairman, was second as a birdgirl in a costume that had also been designed by Eddie. Honorable mentions were awarded to Norman Shorrock, Tony Walsh, Eric Jones, Bob Richardson, Bobbie Gray and Norman Weedall. AT SUNDAY MORNING’S BSFA Annual General Meeting it was announced that Terry Jeeves had defeated Jill Adams in the straight fight for BSFA vice-Chairman. Terry joins Ina Shorrock, Joe Patrizio, Ted Forsyth and Jimmy Groves on the new Committee. It was decided to inaugurate a Dr. Arthur Weir Memorial Fund in the name of the Association and this was launched to a good start by the audience present. Donations to this Fund and of course BSFA non-members are also invited to contribute if they so please - should be sent to the retiring Treasurer, Archie Mercer, 434/4 Newark Rd., North Hykeham, Lincoln. As already announced on the front page, Harrogate was given the honour of hosting the 1962 Convention and further announcements will be made through SKYRACK’s following issues (if I survive the weekend). Several attendees of the LXICon were keen to register as members of the Harrogate convention immediately but I am sure that it will be understood that bookings of any type cannot really be made until more firm plans are made in arrangement with the concerned hotel. ON THE SUNDAY AFTERNOON the Science Fiction Club of London presented a short but well received play, the full text of which will shortly be produced in one of the club’s publications. ERIC BENTCLIFFE, Britain’s 1960 TAFF Delegate to the PittCon, spoke on his trip and produced another in his “This is Your Fan Life” series, if anything an improvement on last year’s production. Once again the victim’s name had been well clothed in secrecy and Eric Jones was eventually spotlighted.. The show was well supported by acting from several different fen. VARIOUS AUCTIONS were made throughout the weekend, probably the most notable being Sunday’s TAFF auctions. Many lots of books and. magazines were redonated to the auction by their three shilling (evidently a stock bid.) buyers and. as time was running short the last lot was an entire tea-chest crammed with books and magazines which raised £2. The entire auction raised £18 to match last year’s figure. Eric Bentcliffe ran a TAFF auction on the lines of the SolaCon’s “Auction Bloch” at which various professional authors were sold off to the audience. Ken Slater took Brian Aldiss for 22/6d, Norman Shorrock bought Ken Bulmer for 17/-, Alan Rispin bought Bruce Burn’s Bushy Barbarian Beard. for 12/6, Ethel Lindsay acquired Walt Willis at the bargain price of £1 and. Walt’s production, “The Harp Stateside,” went for even more than the man himself for 25/- to Peter Mabey. At the conclusion of the Auction Bloch, Kingsley Amis said how much he had enjoyed the convention, asked for the first membership for next year’s Harrogate con, and agreed to be auctioned off himself. A syndicate composed of members of the SFCoL (Don Geldart, Ted Forsyth, Joe Patrizio, Bruce Burn and Ron Bennett) which had been formed in the eventuality of the Guest of Honour’s sale, bought Kingsley for £2. 10s and are now at a loss as to what to do with him. Readers, do you want to read Kingsley Amis in OMPA? In Skyrack? MORE FILMS WERE SHOWN on Sunday evening to end the programme as it began, but these were of a far better quality. Two scientific films from the Shell Company thoroughly intrigued the audience. Dave Kyle had brought over the Los Angeles Unicorn production fan film, “The Musquite Kid” starring TAFF candidate Ron Ellik. And finally the professional film, “Forbidden Planet” was shown. THE CON HALL itself presented a scene reminiscent of past conventions in its many colourful displays. Ken Slater, who organised an initial quiz, was this year assisted by Dave Barber at his stand and at the SFCoL display and OMPA one-shot session ran virtually continuously throughout the weekend.....OMPA also held a meeting.... A wag in the bar asked Norman Shorrock and Ron Bennett what the conference was about and when being told it was a meeting of communists, asked Bennett to sing the third verse of the Red Flag..... Fanzines received during the convention and immediately prior to it will be reviewed next issue...... A terrific convention, of course, and these pages can only cover hurriedly compiled notes. I’m indebted this issue to help provided by Brian Jordan, who duplicated the issue, and Fred Parker who provided the coffee. Whereas it appears traditional in fandom for news magazines to celebrate their birthdays with popularity polls, it also appears that fans may be becoming sickened with poll-form filling in (or out, depending on birthplace, I suppose) for only 22 fans returned forms this year, as against 35 last year. The twenty-two Good People were: Jill Adams, Ron Bennett, Eric Bentcliffe, Sid Birchby, Redd Boggs, Bruce Burn, Bob Coulson, Ted Forsyth, Colin Freeman, Lynn Hickman, Terry Jeeves, Betty Kujawa, Ethel Lindsay, Jhim Linwood, George Locke, Chris Miller, Ella Parker, Joe Patrizio, Bob Richardson, Alan Rispin, Norman Shorrock and Arthur Thomson. 1. ORION (166 points) Ella A. Parker, 151 Canterbury Rd., West Kilburn, London N.W.6. 1/- or l5cents. 3rd place last year. 2. 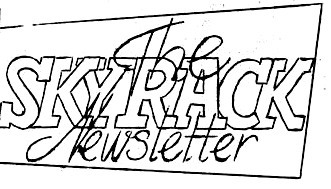 THE SKYRACK NEWLETTER (126) 5th last year. 3. SMOKE (114) Sgt. 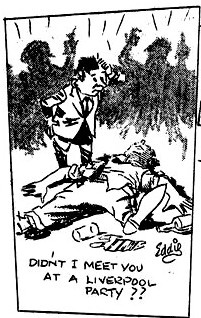 George Locke, 24 Field Ambulance, BFFO 10. 1/.- or 15cents. 6th place last year. 4. HYPHEN (92) Walt Willis & Ian McAulay, 170 Upper Newtownards Rd. ,Belfast 4, N. Ireland. l/-. or 15 /. 2nd last year. 5. BASTION (91) Eric Bentcliffe, 47 Alldis St., Great Moor, Stockport, Cheshire & Norman Shorrock, 2 Arnot Way, Higher Bebington, Wirral, Cheshire. 1/6d. 6. APORRHETA (78) Sandy Sanderson, (note new address) 2805 University Ave, Apt 41 Bronx 68, N.Y. USA. First place last year. 7. ESPRIT (69) Daphne Buckmaster, 8 Buchanan St., Kirkcudbright, Scotland. 1/6d or 20 . 8. TRIODE (49) Eric Bentcliffe and Terry Jeeves. 4th last year. Now folded. 9. RETRIBUTION (45) John Berry, 31 Campbell Park Avenue, Belmont, Belfast 2, N. Ireland. 1/-. 8th last year. 20. HAVERINGS and SCRIBBLE (7). Sincere congratulations to Ella Parker l-l of the SFCoL whose success is not wholly unexpected. And well done, Eric, Norman and Daphne on making the top ten during the first year of genzine publication of BASTION and ESPRIT. 17 different items were listed. 1. A tie between THE GOON GOES WEST by John Berry in CRY (4 points) and HOW TO DRAW CURLY MONSTERS by Arthur Thomson in ORION (4 pts). 1. INCHMERY FAN DIARY by Sandy Sanderson in APORRHETA(11 points) and SPECS by Ella Parker in ORION (11 points). 1. ARCHIE MERCER in Cactus 5, ELLA PARKER in Orion 25, and JOHN BERRY’s Goon Goes West in CRY( 2 points each). BEST BRITISH FAN WRITER OF 1960. 1. John Berry (47 points) lst place last year. 2. George Locke (44) 4th last year. 3. Sid. Birchby (31) 8th last year. 4. Walt Willis (25) 2nd. last year. 5. Mal Ashworth (13) 6th last year. 6. Ron: Bennett (13) 5th last year. 9. Ella Parker (7) ArchieMercer (7) 10th last year.